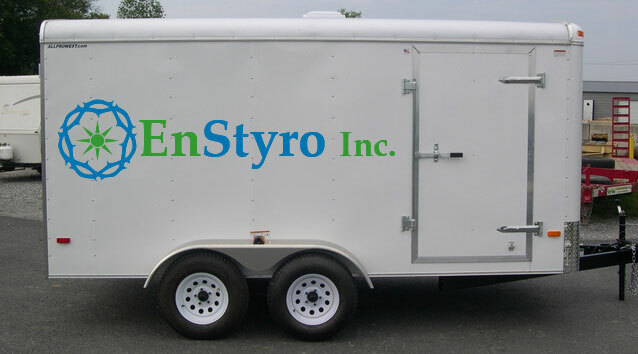 The Enstyro foam ripper can be operated from an enclosed trailer. This is an asset for equipment rental companies and demolition crews. Many companies need the machine only periodically to convert their EPS waste to useable material. This saves the company on trash costs and produces a quality end product. Demolition companies can process their foam waste on site, which reduces trash and transportation costs while creating loose fill insulation or concrete aggregate. The mobile unit can also be used for curbside recycling. This method allows for processing on the go. Larger amounts of granulated foam fit into a trailer than unprocessed material. Routine drop offs to end users of the recycled foam can eliminate the need for a facility to house and store the material.